To complete these in-vitro systems, we have developed our own infrastructure to simulate the human colon, with the goal of having a modular system for maintaining a human microbiota in similar environmental conditions to those encountered physiologically and pathologically in the human gut. This system was developed with the technical support of Global Process Concept. It consists of three bioreactors which can operate independently, but also may be associated with each other. It is possible to supply each bioreactor with an identical nutritive medium from the same tank or to supply each with a different medium. The usual medium thoroughly replicates the contents of the terminal ileum from an individual with a Western diet, as described by several groups. This basal medium is shown in Table 1. If required, it can be modified to simulate other systems or to simulate specific cases, such as the uptake of prebiotics, the excessive presence of protein residues due to poor hydrolysis/absorption in the anterior parts, or an excess of bile acids. Table 1. 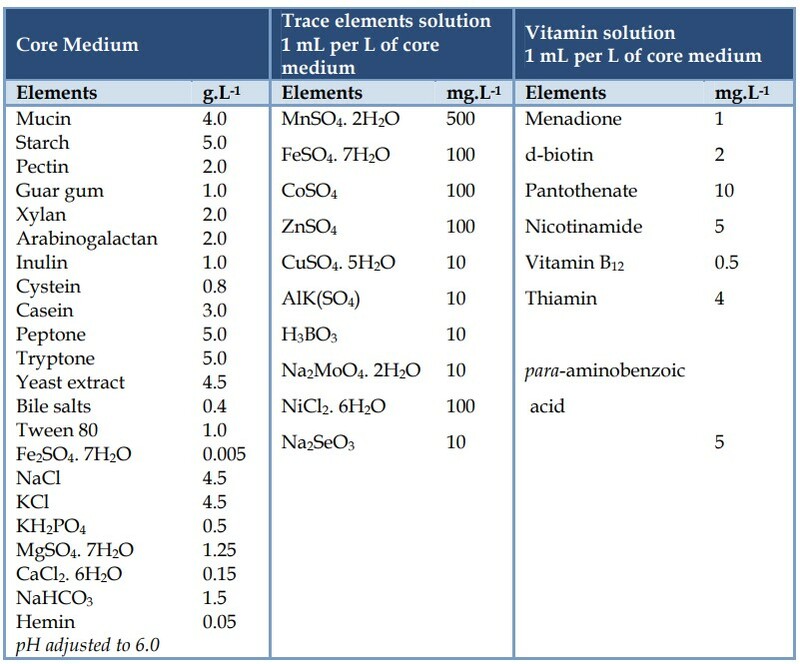 Composition of the artificial gut medium. Each modular system is based on a bioreactor that can operate autonomously if necessary (Fig. 1). Each bioreactor is composed of a tank and an upper plate. The 2L tank is made from borosilicate glass, mounted on a removable stainless steel frame. Its minimal working volume is 0.5 L, however, it is used in all our different ECSIM variants with a volume of 1L. The tank has a jacket permitting the circulation of water from its own heating module (tank with electric heater and circulating pump) to maintain the temperature of the culture. The top plate (stainless steel) has various ports and accessories allowing the use of an agitation motor, an aeration at the tank bottom through a removable sparger, and a gas outlet equipped with a stainless steel condenser (for a max flow of 15 L/min) with an expansion chamber and internal coil for circulating cold water. The stirring inside the tank is made in a pendular motion using a Rushton turbine and a marine HPTG propeller (each with a diameter of 60 mm) with adjustable height on the stirrer shaft. 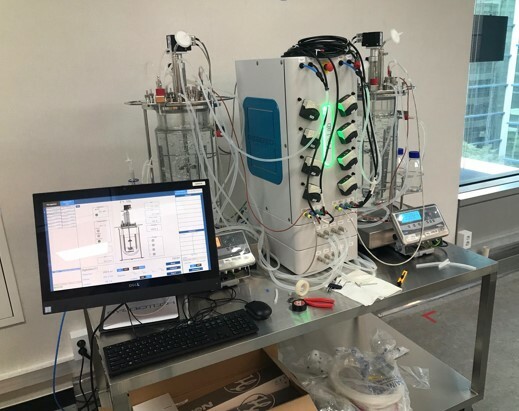 The system incorporates a temperature sensor, pH electrode, redox electrode, a liquid level or foam (modular) sensor, and an injection input for pH correction (which can be used for the substrate). The plate has a sterile sampling device for sterile medium inoculation, addition and sampling. Each bioreactor has its own control terminal connected to a PC via an Ethernet cable. Dedicated software is used to control the stirring speed (variable from 40 to 1000 rpm), temperature, pH, ORP and the level regulations and measurements. In parallel, the terminal controls four peristaltic pumps (to ensure the addition of nutrient solutions, neutralizing solutions and tests) and valves to automatically control the gas flow. The dedicated software (using Windows) allows a hierarchical control of experiments (4 levels), ranging from single view measurement tables in real time without the possibility of intervention through access, to full functionality (detailed configuration and complete opportunity to exit the software and turned off the set).